I’ve been struck by how often our words fly by each other without any real sincerity to them. Have you noticed how punctuated and meaningless our exchanges have become? We appear to have normalized nonsensical exchanges, bereft of any genuine meaning. Real intention, real inquiry, real caring has slipped into the ether as we verbally transact with each other in a robotic way. What was once a profound and significant sharing, “I love you,” has been shortened into, “Love ya.” Very often the person saying “love ya,” may in fact not really love the person they’re speaking with. It feels perfunctory and you can predict the moment of its utterance; at the conclusion of a conversation or the parting of ways. We have substituted saying “goodbye,” for “love ya.” And in doing so we’ve debased the loftiness of the word love. By simply adding the word “I” back into the expression you commit to a deeply authentic and emotional sharing. If you really want to make this statement more profound, offer it at an unexpected moment, not when you’re parting company. Spontaneity speaks to sincerity, predictability is rote. On occasion I will receive a text from my son without any prompting in which he writes, “I love you dad.” That of course brings a smile to my face and warms my heart. Many times a day we may walk past an acquaintance and say, “Hi, how are you?” The other person smiles, says, “good and you?” And we likely respond similarly. Are we both always good? That’s a rhetorical question of course. A few years ago, I was taking a walk on my way for a cup of coffee. I encountered a parking attendant with whom I was familiar outside of a neighborhood restaurant I frequented. This gentleman and I had a number of engaging conversations in the past and so I asked the predictable, “How are you doing Jacques?” He smiled and said, “I can’t complain.” I smiled back and continued on my walk. I explained to Jacques that when I asked how he was, I did care and truly wanted to know. When we greet one another and inquire as to how we’re doing, without either party answering honestly, it becomes an exercise in inauthenticity. We act as uncaring strangers. We cut ourselves off from human interaction. And we suffer for that. We can do much better. Jacque’s belief that no one would care is of course false. I cared. It may be that many wouldn’t care, but why preclude those who might? To be true to yourself, you need to be authentic. Without going into details, your answer might sound like, “I’ve had better days.” That opens the door to a genuine interaction. You never know what might evolve from that. But at the least, you’re being honest with yourself. It’s really important to be authentic no matter what you expect from another person. This article was excerpted from Mel’s new book, The Possibility Principle: How Quantum Physics Can Improve the Way You Think, Live and Love. Mel Schwartz LCSW MPhil is a psychotherapist, marriage counselor,TEDx speaker and corporate leadership and communications consultant. 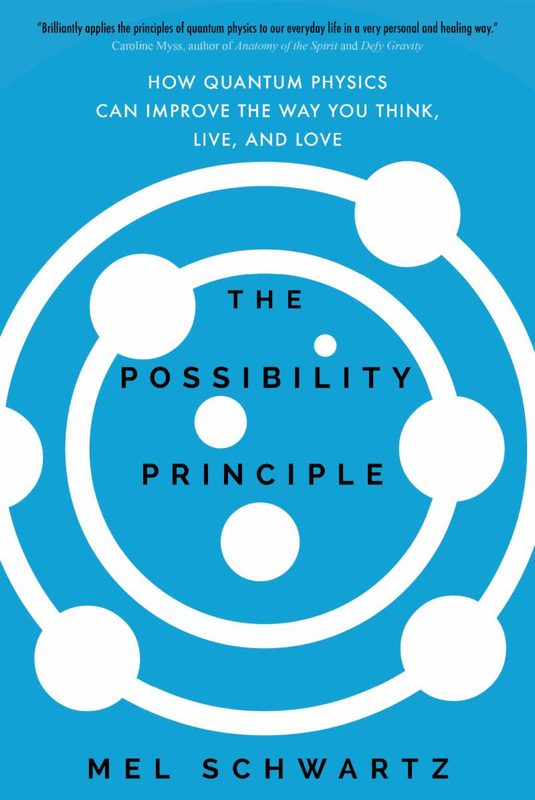 He is the author of The Possibility Principle: How Quantum Physics Can Improve the Way You Think, Live and Love. Mel earned his graduate degree from Columbia University. Mel’s TEDx talk, Breaking Free From Anxiety receives over 50,000 views per month. The Possibility Podcast has just been launched. Listen in to get his insights into living to your fullest potential. He has written over 100 articles read by more than 3 million people. One of the first practicing psychotherapists to to integrate the principles of quantum physics into a transformative therapeutic approach.Mel practices in Westport CT, Manhattan and globally by Skype. What does it mean for someone to be truly authentic? And how many people do you know actually fit that description? Do you feel that you’re authentic? Let’s take a look at what this word truly suggests and just what blocks us from achieving authenticity. Naturally, the word authenticity evokes an image of something pure or unadulterated. A letter of authenticity confirms that a certain object or work of art is not a counterfeit. The act of authenticating is a process of determining that something is indeed genuine, as it is purported to be. Experts receive training to authenticate precious objects, memorabilia, and documents, among other rare items. Yet we have no such method for ascertaining the authentic nature of people. Short of being caught in a bold-faced lie or transgression, methods of determining an individual’s authenticity often go unexplored. One’s authentic nature is revealed in their ability to express and share what they think or feel in a relatively unadulterated form. Diplomacy, political correctness, false flattery, people pleasing, avoidance and silence may, in fact, be designed to mask the authentic, unfiltered self. What does the dictionary have to say? Merriam-Webster defines authentic as a quality of being genuine and worthy of belief. Hence, a person who is completely trustworthy is deemed to be authentic. Yet to be genuine requires a certain transparency, whereby others can witness the unfiltered personality, without any masking. Most of us are too concerned with what others think of us. As such, we may disguise or manipulate features of our personality to better assure that others aren’t judgmental or adversely reactive to us. If I worry about what others think of me, then I manipulate my personality and communication, either to seek approval or avoid disapproval. This masks my true or authentic self. Although this personality trait is commonplace, it is far removed from authenticity. This betrayal of our self is what I call other-esteem. There appears to be an inverse correlation between one’s sensitivity to what others think of them and the ability to be authentic. Authenticity requires a genuine sharing of our inner self, irrespective of the consequences. Very often, our actions in a given moment are intended to avoid certain consequences. And so we alter or mitigate our communications or behavior to assure that those consequences won’t be negative or problematic. These tendencies diminish our authenticity and they constrain our growth and self-esteem. Being authentic requires a genuine sharing in the present moment. Ordinarily, though, our thoughts conspire in a tangle of excuses as to why we can’t do something. These are the consequences to which I was previously referring. This is the core of inauthenticity; our words or actions become disguised from their original intent since we choose to mask them. When this occurs, we literally subvert our genuine self. We might think to ourselves, “What’s the big deal? It’s just a little white lie,” or, “I don’t want to hurt their feelings,” or, “They won’t really care about how I feel.” It’s actually much larger than that. The greater harm done may not be to the other but to our own self. When we alter our thoughts and feelings for the purpose of a safer communication, we limit our own development. It’s as if we suppress our authenticity in deference to a safe and non-challenging communication. This devolving from our more genuine self typically begins in childhood as we encounter any host of emotional challenges. If we experience abuse, disappointment, fear, or devaluation, we begin to alter our personality as we attempt to cope with these wounds. Although the coping mechanisms are adaptive at that time, over the course of a lifetime they become masks that distance us from a more actualized sense of self. Even more problematically, the opportunity for a more meaningful dialogue that might generate a better understanding between parties becomes blocked, as the truth never quite gets revealed. And so the relationship remains stuck. Two individuals who struggle with their own authenticity unconsciously conspire toward an inauthentic relationship. In fact, this is one of the largest impediments to successful relationships. Two individuals struggling with their own authenticity wouldn’t likely experience a thriving relationship. Very often, what we might refer to as a troubled relationship is, in fact, a manifestation of the challenges each individual face in their own personal evolution, but just further projected onto the external relationship. I am not suggesting that we be callous or insensitive to others’ feelings. Learning how to communicate challenging matters in a delicate and compassionate manner opens the pathway to an evolving relationship. And a commitment to personal evolution honors authenticity. When we devote ourselves to such a path, we actually cast off the burden of fear and anxiety about what others may think of us and begin to honor our own authenticity. An authentic person may be sensitive to what others think yet choose not to subordinate themselves to the opinions or judgments of others. This is a key source of genuine self-esteem. You might begin to think of the departure from being genuine as a self-betrayal. And self-betrayal is a terribly destructive action, after all. It has many faces. Being a people pleaser or avoiding confrontation betrays your own authenticity, as you submerge yourself in deference to others. Conversely, being controlling or acting out in anger distances you from being genuine. In these circumstances, you may be more comfortable wearing the mask of anger than revealing your vulnerability. Fear and insecurity are often at the core of anger. As an aside, when people communicate their vulnerable feelings, others actually tend to listen, and validation becomes a possibility. Angry people may be feared or avoided, but they are seldom validated. Genuine self-esteem requires avoiding self-betrayal. You can’t be true to yourself and betray your authenticity at the same time. This is not to suggest that you shouldn’t act from compassion and generosity toward others, but you shouldn’t undermine yourself in the process. It’s the exceptional individual who seeks authenticity. Much of the problem lies in the fact that being genuine is devalued in our culture, while success, achievement, and avoiding criticism are highly prized. Our prevailing cultural imperative does little to value authenticity. This goal appears nowhere in the curricula of our education. If our primary education provided coursework that taught us how to achieve emotional intelligence and the skill set of genuine communication, we might realign our priorities accordingly. The competitive spirit honors the winners, not the most sincere. And within that motif there is a belief that being authentic may impede success. Yet one need not preclude the other. If you untether yourself from insecurity and fear, you can set the stage for a self-empowered life. Freeing yourself from the tribulations of worrying about what others think of you emboldens you to be genuine. Many of us ask ourselves the age-old question, “Who am I?“This question presumes there might be a plausible answer, as if our identity could- or should be- reduced to a fixed description. Individuals who ask this type of question are usually struggling around their core sense of self and grasping for a concrete answer. The paradox is that the more you seek to solidify who you think you are, the more fragile you feel and become. So, this question as to who I am is the wrong question to ask. We’d be far better served to contemplate, “How would I like to experience my life?” The former question focuses on a fixed state of being, while the latter one envisions participating in the flow of your life-your process of becoming. There is great benefit to be derived when we shift from notions of a fixed, inert identity to one of an evolving sense of self. Rather than taking a frozen snapshot of yourself, try to embrace an unfolding sense of self that enables you to perpetually re-frame, re-craft and re-think yourself and your experiences. This process of becoming allows you to move beyond the confinement of your past experiences and usher change into your life. When you learn to do this, you can access new possibilities in your life. The process of becoming lies at the heart of the possibility principle. This principle, which I illuminate in my new book, The Possibility Principle, reveals how we can prosper and thrive by embracing uncertainty. As we strive to know ourselves, in all of our complexity, we must also pay attention to the evolving and unfolding process of life itself. We should consider how our past and our interpretation of it -the meaning we choose to give to it-has informed our present. Rethinking your past and placing it in a new context permits you to craft a different present and future. That is what a healthy change process looks like. Often, it’s a sense of turbulence or insecurity that has us inquire, “Who am I?” Imagine that you’ve been imprisoned for twenty years, incarcerated since the age of twenty. You literally had no adult life experience outside of the penitentiary and so your sense of self is extremely limited. You are about to be released from your confinement. The question, “Who am I?” would provoke a very fragile sense of self that might leave you ironically apprehensive about your impending freedom. Yet it’s unthinkable that you’d choose to remain behind bars until you could secure your future identity. You’d have little choice but to move forward into the uncertainty of what lies ahead and welcome your experience of becoming. This process of becoming requires that you get out of your own way so that you can embrace your natural unfolding.To accomplish this, we must welcome uncertainty. The embrace of uncertainty results in new possibilities. I have worked with people who have been mired in unhappy marriages, were unsuccessful in couples therapy, and yet chose to remain stuck due to their fear of who they would be as a divorced person. They might ask worriedly, “Who would I be?” The challenge they face is around their need for certainty. The irony is that they might default to their current certainty-unhappiness- rather than elect to experience the uncertainty around their process of becoming. At the other end of the identity continuum are those who claim to know themselves so well. This group of individuals may also have a deep fragility around their sense of self. To know yourself so well leaves little room for growth. It speaks to a very defensive and fixed sense of self. Even more, it speaks to a protective mechanism that may guard against deeper reflection and change. If I’m dead certain that I know exactly who I am, then I must be a fixed entity, stuck in my state of being. It’s wise to self-reflect and invite introspection, but doing so requires maintaining a delicate balance. Be cautious not to fall prey to overanalyzing. The goal is to maintain malleability as you engage in your reflection, as if you were a willow tree rather than a sturdy oak tree. The willow is flexible and survives the storm as it bends with the vicissitudes of its environs, whereas the rigid oak is more likely to crack. When you maintain this flexibility during reflection, you’re more contemplative and forward-looking, allowing you to unfetter yourself from the imprint of your wounds. Try to envision how you’d like to experience your life and note the aspects of yourself that you’ll need to let go of. Then look at your core beliefs and recurring thoughts that keep reinforcing your confinement. Work with that dissonance as you release your past. Embracing uncertainty enables us to join with the perpetual flow of the universe. The process of becoming feels forgiving. In the flow of becoming, you’re no longer rooted in the hardship of fear, insecurity or concerns about mistakes. Becoming is boundless and infinite, whereas being is structured and limiting. Quantum physics informs us that all of reality is perpetually flowing, a kind of reality-making process. Nothing is static or inert. All is in the flow of becoming. We can join in that ride once we shift our perspective and embrace the uncertain. Mel Schwartz LCSW MPhil is a psychotherapist, marriage counselor,TEDx speaker and corporate leadership and communications consultant. He is the author of The Possibility Principle: How Quantum Physics Can Improve the Way You Think, Live and Love. Mel earned his graduate degree from Columbia University. Mel’s TEDx talk, Breaking Free From Anxiety receives over 50,000 views per month. He has written over 100 articles read by more than 3 million people. One of the first practicing psychotherapists to to integrate the principles of quantum physics into a transformative therapeutic approach. At this time of year many of us make New Year’s resolutions that over time wither and fade as we try vainly to transform some aspect of our lives. What begins with a hopeful optimism descends in yet another unmet aspiration. It’s always a curiosity to me how we seek change in the same way that produces the same failure. I imagine that if we conducted a survey six months after the New Year and asked people about the success of their resolutions, we’d find an abysmal rate of failure. Our struggle with change is resoundingly difficult and scant attention is devoted toward understanding why that’s so. Change begins as a thought, underscored by a wish or even stronger, a desire. This may set in motion an even stronger feeling, an intention. Most people find themselves somewhere within this continuum. Clearly, where you fall within that range is important toward the eventual outcome, but nevertheless insufficient for an assurance of reaching your goal. What typically prevents the success is the necessary commitment–the vaulting into action–that supports the transition. A number of years ago, on the occasion of my voicing a resolution —to get into shape and work out regularly—a dear friend asked me when I’d actually be doing that. I said, ” at least three times a week.” He responded with a ringing clarity, ” If it’s not in your calendar, day and time, you’re not committing to it.” He was quite right. The intention wasn’t enough. It was lacking willfulness. I came to appreciate that intention must be coupled with will. To change we must engage a willful intention. It’s not uncommon to initiate the change, but over time we tend to retreat back into the old familiar zone and loosen our grip on the new progress. Sustaining change is often more difficult than initiating it. This is because we haven’t fully committed to the progress. We make a bit of change, breathe a sigh of relief and give ourselves a break. And the change evaporates. Your willful intention, if grounded in conviction, can lead to what I call a defining moment. It’s an instant in which we become so invested in the change we desire, that we commit to a turning point in our lives. We are in fact changed as of that moment. This is a defining moment in which we come to see ourselves differently, act upon it, and become transformed. The defining moment alters everything. It is the engine that drives the change. The introduction of this new catalyst alters how we think and how we operate. It introduces a new habit into our being and literally alters our bio-chemistry. Neuroscience is now clearly confirming that our thoughts do indeed alter our brain chemistry. Sustaining the new thinking and embracing it with conviction becomes achievable with a deeply rooted commitment. Anything short leaves us falling short. Old habits die hard because old thought defends its territory. Thought and behavior are inextricably connected. This habitual pattern literally creates a groove of thought, feeling and behavior. And it here that we get stuck. In order to disrupt that habitual pattern, we must intervene with a significant force, the defining moment in which we embrace the change and nothing stands in the way. This requires embracing the disquiet of new behavior. We need to take the discomfort and make it our ally as we align with the new shift. A resolution isn’t enough; a turning point into new terrain is required accompanied by the energy to sustain it. In any given year approximately 40 million Americans will suffer from a debilitating encounter with anxiety. Over the course of your lifetime, there’s a 25% chance you’ll experience a diagnosable anxiety disorder. This is such a staggering rate of affliction. It appears we’ve adapted to a new norm—one of mass disquiet. We have become habituated to—and normalized—an epidemic of anxiety. If 40 million people fell suddenly ill, The Center for Disease Control would be working overtime to find both the cause and the cure. As a culture, we only look superficially into the cause of anxiety and focus more on the treatment—typically management through medication. We need to do much better. As a practicing psychotherapist, I’ve been looking at why we are suffering in this way. It’s time we disrupt our complacency around our victimhood. Stress is normal in our hurried lives. We can look at stress as a byproduct of our adapting to the challenges that confront us. Stress is the result of our deeper engagement with life that can lead to growth, new learning and productivity. But when stress turns into distress it impedes our ability to live well, to live joyfully. Distress calcifies into anxiety. So, the question is: why do we suffer from this avalanche of anxiety? Here’s what I’ve learned. Anxiety— at its source— is due to our relationship with our thoughts. In particular these are the thoughts which are perpetually seeking certainty. We want to know what the future will bring, and what the consequences of our decisions will be. But that future is of course unknowable. And so, we become anxious as we try to ward off the unknown. This results in our not being in the flow of life as we try to hold back the future. Ask yourself, “What causes me distress and anxiety?” Does it have something to do with your uncertainty about the future, your fear around decision-making? There it was. Her fear around the unknown—which offered her possible relief and new possibilities—kept her imprisoned with anxiety. She was actually choosing to stay miserably in the known rather than face the uncertainty of a different path—one that might have brought her joy. The question, “Who would I be?” froze her with fear. We invite uncertainty into many aspects of our lives. We enjoy watching sports and movies because of the thrill of not knowing. But in our personal lives we become choked by predictability and certainty. Seeking predictability stunts our relationships, our curiosity and our greater engagement with life. So how did we become so attached to needing to know the future in advance? I track the cause to the great 17th century scientist Isaac Newton. He instructed that if we had sufficient information—in today’s jargon we might call that data—we could reasonably predict the future. This became known as determinism. And we have become addicted to this way of thinking. Determinism has benefited us in many ways, but at the extreme it’s led to much pathology. We live life as though we were playing a chess match. We sit back and calculate our next move. We might fret over whether our decision will be a “mistake.” We slice and dice and analyze the possible consequences of our decisions and we get frozen. We don’t move forward as this straitjacket of fear blocks our flow of life. If you feel anxious around decision making, you’re likely addicted to seeking predictability. Here’s the good news! It turns out we’ve been living from the wrong game plan. Over the last hundred years quantum physics has revealed an astonishingly different picture of reality. Unlike Newton’s determinism, reality appears to be thoroughly uncertain and that’s actually good news. It seems that nothing is fixed or inert. The universe appears to be perpetually flowing and bubbling with potentiality, a virtual sea of possibilities. We too can join into this new worldview. When we learn to reframe our relationship with uncertainty, we invite in new possibilities. Remember that what you resist you make more formidable. Paradoxically if you choose to welcome uncertainty it becomes your ally. When we welcome uncertainty and literally embrace it, we are in movement, joining in the flow of the universe. We are then able to navigate our life as it unfolds, in real time. When you free yourself from the torrent of addictive thoughts seeking certainty, you join in the flow of your life and anxiety retreats. It turns out that the epidemic of anxiety is primarily due to living from an outmoded game plan for life. It’s time to embrace what we’ve been resisting and make uncertainty your ally. Uncertainty can become the wind in the sail of our change process. Many years ago, I’d often fall into a recurring disagreement with my former wife. At bedtime I’d frequently find myself saying, “It’s hot in here.” She’d respond, “No it’s not, it’s cold. ‘’ This led to a frustrating ,mind-numbing back and forth that went nowhere. It took quite some time until I reached a breakthrough by simply saying, “I feel hot.” After all she couldn’t tell me I didn’t feel hot. By removing the words—it is— I moved from making an objective statement to a subjective statement. This allowed me to shift from a battle over the truth into simply sharing my perception. Of course, that didn’t settle the issue around the thermostat, but nevertheless I felt some relief to get past that argument. I did, however get proactive about throwing the blanket off my side of the bed. I remembered that exchange and started to focus on the importance of words. We pay very little attention to the words we express and don’t appreciate how profoundly they affect us and impact others. Over the last 20 some odd years, in my work as a psychotherapist and communications consultant, I’ve devoted my attention to understanding what gets in the way of successful communications. I’ve learned that words matter very much. Our words either set the stage for others to be open and curious about what we say or defensive and reactive to what they hear. Our words become the foundation of our relationship not only with others but they become a key ingredient in our relationship with ourselves. Our thoughts actually script our life experience. These thoughts impact us far more than anything else, more than our closest relationships. But what comprises our thoughts? Words. When we string words together they become thoughts. Some words in particular terribly limit us. I’m referring to the to be verbs. We can find them in virtually every sentence we speak. Recall the word is, in the battle over the room temperature? So why do I see a problem with the to be verbs? Let’s take a look. Many verbs express movement and action. But the to be verbs have one element in common. They all connote a fixed, unchanging state. The to be verbs are all inert and static. None of these words capture a picture of change or flow. So, if words inform our thoughts and if we employ the to be verbs in virtually every thought, how can we feel anything but stuck? Let’s look at the word am. “I am worthless,” or “I’m unlovable.” These beliefs collapse into truths as they become unchanging facts in the story we tell ourselves.. How can we envision and actualize change if our thoughts get stuck in an unchanging, inert picture of reality? The to be verbs block new possibilities. They block movement. Let’s look at the common refrain, “It’s hard to change.” Most people would agree with this belief. Of course, change would appear challenging when we our thoughts are cemented in the to be verbs that preclude change. Let’s look at what happens when we make the statement, “It’s hard to change,” without using to be verbs. You might say, “I struggle to change, or “It feels so hard for me to make change.” Or, “I’ve never succeeded in making change.” These statements still appear amenable to change. They speak to subjective perceptions rather than facts. Change can happen when you shift from making an absolute statement of fact to one of perspective. In 1933, Alfred Korzybsky in his groundbreaking book, Science and Sanity introduced the idea of eliminating the to be verbs from our common usage. He proposed that the to be verbs were relics of an old worldview; Newton’s 17th century mechanism. This classical view of reality depicted a machine-like universe comprised of objects, separate and distinct from one another. They appeared inert and fixed unless outside force was applied. We became these objects. The lack of connectivity seen in Newton’s reality, led to the ideal of objectivity. This construct of objectivity requires standing apart from what you observe; Newton’s theme of separation. This picture of the universe presented a cold, austere machine-like reality. This looks like a very inhospitable place for humans to exist. The to be verbs speak the language of the machine-like universe in that fixed objects and objectivity were accorded primacy. These words preclude movement, possibility and potentiality. And so once again, we see ourselves as stuck. This has an immense and unimaginable impact on us. At the time of Korzybski’s writing, the radical discoveries of quantum physics turned our notions of reality upside down. We came to learn that reality appeared radically different than what Newton had depicted. This emerging worldview described reality as perpetually flowing and bubbling with possibility, a virtual reality making process, with all parts inseparably connected with one another. Everything flowed as one inseparable whole. From this new worldview change no longer appears hard, it in fact seems inevitable. The thesis of an objective reality became replaced by a participatory subjective reality. This new worldview looks very warm and friendly to humans, as human participation informs reality and we no longer see ourselves as disconnected objects. To access and benefit from this new vista of reality we need to alter our language since the to be verbs keep us stuck in 17th century reality. Korzybski urged that we speak and write without using to be verbs. He called this E-Prime language— the omission of to be verbs. When I became aware of this shift in language I began to utilize it as a transformative communications technique. During my years as a therapist I’ve come to see the remarkable progress many people have made when they learned to limit these verbs, particularly in challenging communications moments. Let’s look at more of the benefits. Our negative feelings and thoughts about ourselves become inveterate due to our use of to be. These verbs imprint their message on us as they keep us wedded to them. I recall working with a middle-aged woman who constantly insisted that she was stupid. She said, “I am stupid.” I asked, “How did you come to this belief?” She replied, “My dad often said that to me when I was a kid, so I’ve always felt stupid. I ruminated with her, “So maybe you “are” not stupid, but have always simply felt that way?” This exchange opened the door for her to reconsider this aspect of her identity. If she always felt that way, she could open to changing how she felt. We shifted from objective reality to perceptually constructed truth. Look at your negative beliefs about yourself. Notice the to be verb— surely, you’ll find it— and restate your belief without to be. To be verbs anchor us in feeling inert, powerless and as victims. They speak of objective truths rather than perceptions and feelings. When we speak in E-Prime, it enables us to move beyond our fear of making mistakes. When you communicate from your subjective perception—the language of the new quantum worldview—you avoid the pitfall of right vs. wrong. When you say, “I think,” or “I feel,” you invite the other person into your experience. During a consulting gig I facilitated with a C-suite executive, she shared a bold and innovative perspective she had about a particular challenge the organization faced. When I asked her why she hadn’t shared this with her colleagues, she told me she felt intimidated about their judgment of her idea. I helped her craft the message by using E-Prime. “I have a thought I’d like to share about our problem…” or, “This may sound a bit out of the box but an approach occurred to me that we never considered before.” If you simply share your thoughts, perspectives or ideas in a subjective manner you move past the fear of mistakes or right vs. wrong. Free from the dread of making a mistake or concern around the judgments of others invites all participants to share their thoughts and perspectives. This leads to generative dialogues as we can share our inner monologues with one another. This serves as a powerful tool for learning as we begin to think together. The art of thinking together and collaborating flourishes with E-Prime. This method applies to corporations, families, relationships, to all communications. I’ve witnessed how relationships become challenged and deteriorate when we share criticism of one another in an objective manner. Objective statements require to be verbs. Subjective statements avoid to be verbs. Nothing derails a conversation as quickly as, “You are wrong.” To express these words assures that your thoughts and opinions will fall on deaf ears and go nowhere. The moment one utters, “You are wrong,” the other person reacts with defensiveness if not hostility. Shift into E-Prime and say, “I don’t see this the way you do,” or “Help me understand your point, I don’t see this the way you do.” This can open the door to a reasonable communication. I recollect a particular moment in a couple’s session when a woman said to her husband, “You are so selfish.” She expressed an objective statement. The air thickened as her husband prepared his defense and verbal assault upon her. I requested a time out and prepped her to share her feelings in E-Prime. Her subjective offering of “You seem so self-centered to me,” allowed her husband to inquire why she saw him that way. A purposeful dialogue ensued. When you feel particularly challenged or anticipate a negative reaction to what you’re about to say try using E-Prime. Open your sentence with the words “I feel,” or “I think,” or “I’d like to share a thought or feeling with you.” You don’t need to be fanatical about this. Choosing particular moments to speak without using to be verbs allows you to move past feeling like stuck. It also opens the doorway to generative dialogue. It may feel awkward at first but when you invite in discomfort you grow and advance into new territory. You can hoist the anchor that’s kept you feeling stuck when you selectively choose to speak without to be verbs. To be verbs End possibilities. E-Prime opens the doorway to possibilities and shifts us from a stuck state of being into the process of becoming. We can then join in the flow of the universe that the new worldview describes when we unshackle ourselves from the words that imprison us. Please note that all to be verbs in this article appear italicized for effect. This article was the topic of Mel’s TEDx Beacon Street talk at Fenway Park and was excerpted in part from his new book, The Possibility Principle: How Quantum Physics Can Improve the Way You Think, Live and Love. Too often, when we encounter challenges and conflict in our primary relationships we tend to spiral down very quickly. When we’re in this down cycle, rather than pausing to assess what’s happening, we tend to fall into a reactive debate around who is right or wrong. As we all know this non-rational instinct is ruinous and sets up a no win scenario. If I need to be right and that makes you wrong, how’s that going to work out? The more sensible goal is to try to turn the tide of the degenerative energy that you’re both experiencing. In these conflicted downslides that we endure the competitive energy that befalls the couple makes them very antagonistic. To shift back into a healthy, collaborative and supportive experience simply requires a shift of mind. This shift is easy but counterintuitive; we must let go of our reactive impulses and quiet our mind. If you want to re-enter the energy field of the initial romantic engagement or the caring friendship you once enjoyed, try to selflessly get into the other person’s shoes. Doing this doesn’t mean you’re abandoning your position; it simply means you’re trying to care about and validate the other person. You’re not pleading guilty but acting mindfully. If I try to appreciate and care about my upset partner’s point of view, I’m invoking a shift of energy. Connecting empathically with your partner is the most powerful thing you can do in those troubling times. Doing so can turn the tide from a competitive—even emotionally or verbally abusive— exchange back into the loving energy field you once experienced. After all, it’s easy to say, “I love you,” but it’s far more important to be able to act lovingly when you’re feeling upset. Another way of shifting the energy of your relationships is to express positive feelings. Once we’ve defaulted into negativity, it’s natural to get caught in a hostile loop. We succumb to having— and expressing— critical thoughts and feelings about each other. Negativity fills the space between the two of you. There are times in therapy sessions when individuals may share with me positive or appreciative feelings they felt about their partner, even when their relationship is troubled. If I ask, “Did you share that with them?” I rarely hear a yes. It makes no sense to acclimate to negativity and yet avoid sharing something positive. As silly as it seems, we may feel awkward expressing kind thoughts and feelings. This is because we’ve gotten stuck in the groove of negativity, which only widens the gap. We may be holding back something positive so as not to give the other person a stronger hand— a sign that we’ve retreated to separate battle stations. Set a new intention: when you feel good about the other person, share it. This immediately shifts the energy and sets up a breakthrough potential. In trying to reset the downward spiral of your relationship cycle, the common expression, “You can’t change another person,” appears plausible. When we are stuck and embattled, each party becomes more defensive. But from a differing perspective, if you alter some aspect of yourself as we’ve been discussing, your partner will be impacted. Change yourself and your partner is immediately impacted. Don’t try to win, try to understand. Find something you may agree with or some positive perception and the avalanche that is overwhelming you both may retreat. This sets up a new possibility for a fundamental shift about how you feel about each other. This article was excerpted in part from Mel’s book, The Possibility Principle. We too can join into that new worldview. When we learn to reframe our relationship with uncertainty, we invite in new possibilities. Remember that what you resist you make more formidable. Paradoxically if you choose to welcome uncertainty it becomes your ally. When we welcome uncertainty and literally embrace it, we are in movement, joining in the flow of the universe. We are then able to navigate our life as it unfolds, in real time. Transcending Anxiety, Stress and Depression. Intelligence and intuition are very different ways of knowing. We might think of them in opposing ways. Most people tend to default into operating from one or the other. Generally, men tend to value rational intelligence — notwithstanding that we often act completely insane and non-rationally— while women are inclined more toward the intuitive process. Ask yourself whether you more often say, I think” or “I feel.” The answer will tell you if you gravitate toward thinking or feeling, intellect or intuition. Once you identify the part that you’re not in touch with, set your intention to integrate it into your fuller being. Intuition speaks to a way of knowing that is immediate and independent of cognition. It doesn’t require rational analysis. And it runs much deeper and truer than a mere hunch. Intelligence on the other hand is valued as an expression of logical and rational inquiry. First world cultures tend to value intelligence over intuition. We even developed a standard measure of intelligence; IQ. But logic and analysis, the tools of rational intellect although valuable in many ways, can wreak destruction if they become the exclusive way of knowing. To grow in our complexity and be more evolved as humans we need both qualities, not merely one. One way of knowing at the expense of the other leaves us terribly incomplete. When we blend intuition and intellect we can operate seamlessly and powerfully. Our communication opens up on a much more coherent level. This is particularly true between the genders, where we often feel like we’re speaking different languages. When one party speaks in logical language and the other is emotionally expressive, we can anticipate a derailment. A balance of masculine and feminine energy can be achieved by integrating the way of knowing that is foreign to you. People who are oriented towards feeling may distrust their intellect. Those inclined towards thinking may devalue feelings. By integrating both thinking and feeling we can operate on a much more powerful and seamless level. When we integrate thinking/feeling we deepen our understanding and appreciation of one another and develop the ability to tap into a lost art: wisdom. Wisdom is the ability to better perceive the unintended consequences of both our actions and inactions. Being bound to one way of knowing, intelligence or intuition severely limits us. Think of mere intelligence as going through life with binoculars affixed to your eyes. You focus on what you’re looking at but miss the bigger picture. Living solely from intuition deprives us of the wondrous resources of your intelligence. Combine both ways of knowing and you enter into the realm of wisdom.